Yesterday, at 18:30 local time EUMETSAT took control of Metop-B operations, following the three-day Launch and Early Orbit Phase (LEOP) conducted by the European Space Operations Centre (ESOC) of the European Space Agency (ESA). 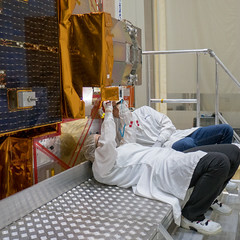 The handover follows the launch of Metop-B on 17 September. Since Monday evening, teams at ESA’s European Space Operations Centre in Darmstadt, Germany, have been busy day and night during the Launch and Early Orbit Phase. As planned, they checked all of Metop-B’s systems and ensured that its solar array was deployed and oriented towards the Sun to provide crucial power to run the satellite and its 11 scientific instruments. On Day One, the ESA Flight Operations teams checked the power, temperatures, software, telecommunication links and activated a number of systems. On Day Two, they deployed five payload instrument antennas. On Day Three, with Metop-B in a near-circular orbit at around 800 km altitude and 99 degrees inclination, the teams conducted one thruster burn to fine tune the orbit and get into ‘phase’ with the orbit of Metop-A – and to prepare for handover to EUMETSAT on Thursday. After the handover, work began immediately on the in-orbit verification of Metop-B, for a six-week period, during which all Metop-B’s 11 instruments will be switched on in sequence.